Desde el borde derecho de la pantalla, deslízate a la izquierda para ver el menú de accesos. 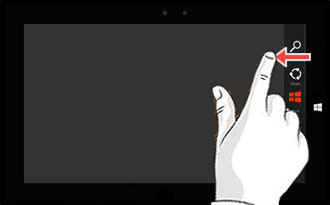 If using a mouse, move the pointer to the upper or lower-right corner of the Start screen then move up/down. Alternatively, press the Windows+C keys ( +C) located on the physical keyboard (if available). Tap or click Change PC settings (located in the lower-right). From the left pane, tap or click Network. If not available, tap or click the Back icon (located in the upper-left) as necessary until "PC settings" appears in the upper-left. Ensure that "Connections" is selected from the left pane then tap or click the Wireless Network icon from the "Wi-Fi" section. From the "Properties" section, view the Physical address.